The creators of Monachyle Mhor Hotel retired to France 12 years ago and lovingly restored this 18th century cottage to offer authentic and charming accommodation in the picturesque village of Parisot, Tarn et Garonne. We think its a good idea to introduce it to you so you can have the experience of rural life in France. Only an hour and a half from Toulouse. It a great base to see, explore and experience the south West of France. The cottages is built on two floors retaining its natural character and has been lovingly and sympathetically renovated by Rob and Jean Lewis. The landscape of this area is enhanced by many features such as the amazing floral and fauna hedgerows. The medieval villages and towns are surrounded by vineyards and lovingly tended allotments dotted around the landscape. The hedgerows are filled with fennel, wild garlic, asparagus, onions and fungus - all great accompaniments to add taste to you food and feed your soul! Rob and I came from Balquhidder in Perthshire, Scotland, to France for the better weather. The farming in Scotland is now left to our children. We are both gregarious and love welcoming people to our cottage to enjoy the relaxed, French way of life. With the medieval villages and excellent restaurants, the area is certainly one of the most beautiful parts of France. There is an en suite shower/wet room with lime stone flag stones and under floor heating. The shower is high powered. The bathroom is decorated very tastefully. The living, dinning and kitchen area are all on one floor. With your front door leading into the lavender filled garden or on the other side is the South facing balcony. There is a wood burning stove for the cooler evenings with wood provided. The kitchen is fully equipped with all modern conveniences such as a gas oven and hob, a fridge/freezer, a microwave, a dishwasher and granite work tops. The kitchen has been designed to be very modern and convenient. Golf du Grand Rodez, Route de Vabre, F-12850 Onet-le-Château, France. Golf d' Albi-Labordes Château de Labordes, F-81000 Albi, France. Outside: The cottage includes garden seating and a barbecue. Utility Room: There is use of a washing machine at the property. The property has a clothes rack, an iron and ironing board. Cleaning / Towels / Linen / Maid service: White crisp sheets and fluffy towels are provided. If you stay longer than a week there is a changeover of linen and the property is cleaned on the Saturday. We had a wonderful time staying here. The cottage is superbly appointed, has everything you need. Very peaceful location, owners are nearby, but never intrusive - although we enjoyed their company and hospitality. Would thoroughly recommend staying here. The area is very rural - like a trip back in time ! We stayed for a week. This is a wonderful location to tour this lovely area. The gite is perfectly formed with a fabulous wet room off the bedroom. The ambience is du calme. Rob & Jean are wonderful hosts. Our dog Winnie particularly enjoyed her stay. We have already booked a return visit. Don't hesitate to book. We wanted a small place from which to visit friends and places we know and it was just perfect. Jean and Rob were so friendly and welcoming, there if you needed anything but discreet and in the background. We had a really lovely week with everything we desired. Lovely people. Large Thursday market 8-12 noon 15 kms Cathedral city, serious supermarkets. On the Aveyron and Garonne it is possible to hire a canoe or kayak to discover the magnificent countryside of the region at your own pace. The hirer will provide quality equipment complying with European safety regulations and will explain how to use it before you set off. Accompanied trips can be arranged, if required. There are many horse riding and pony trekking centres in the region, taking advantage of the enormous number of trails available. There is a vast resource of walking opportunities within the region and this has been recognised by the Fédération Française de la Randonnée Pédestre, which has produced a range of excellent and informative maps and guidebooks. There are many swimming lakes to choose from and most have facilities for safe bathing, water sports, fishing as well as the ubiquitous boules court and picnic area. They are usually well signposted from nearby villages and the local tourist office will be able to point out the nearest one and explain the facilities it offers. By train - nearest station: Ville-Franche de Rouerge. 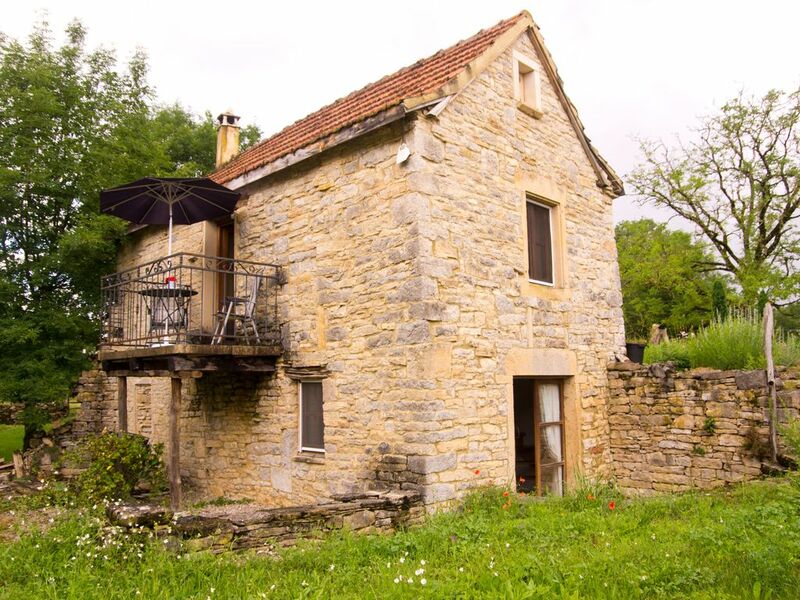 Cottage to Parisot village - 10 minute walk, 3 minutes by car. The village is charming: the many styles of ancient buildings, the varied materials (limestone, oak timbers and old brick), the narrow streets trapping the sky, flowers everywhere, the locals and visitors alike enjoying the shade. At every turn there is something colourful, something curious or something well made to catch the sensitive eye. The village has two boulangerie, mini super market for basic essentials and excellent pharmacy. You can also sit outside for a drink in the local bar. Bastille night is an opportunity to gather to gather with the French and expats. If you need more six miles away the medieval village of Caylus. Offering a variety of butchers, bread, fruit and vegetable. A twice weekly market on a Tuesday and Saturday 8-12 noon set out in the medieval square.. Also a supermarket stocked with all you need. We recommend the Rondevous restaurant. Booking Notes: Part payment required to secure booking. Once your booking is made you will receive email confirmation. Changeover Day: Saturday to Saturday - unless otherwise arranged directly with Rob and Jean. Arrival 3pm onwards. Departure 11am. Notes on prices: Shorter stays can be arranged out of season. This offer is subject to availability, excludes all bank and public holidays.